How do I make a reservation? And when is the best time to make a reservation? To book a trip, go to and click the Trips & Outings link on the top of any page. Before reserving a spot, be sure to check the reservation calendar for available dates, as bookings occur on a first come-first serve basis. When you find an acceptable date, continue the booking process and fill out the necessary forms until the end. You will then receive a confirmation email along with waiver and liability forms, please have those filled out before your scheduled reservation. The reservation calendar will also give you the option of paying for the trip in advance through Stripe, or simply booking a reservation and paying the day of the trip with cash. All advanced bookings with payment through Stripe are 100% refundable up to 24 hours before the trip. The best time to make a reservation is as early as possible- we require at least 24 hour notice for a booking, but try to plan at least 6-10 days in advance if you have a larger group in order to get the date that you want, as most spots fill up by Wednesday or Thursday of any given week. Always have backup dates in mind, as spots tend to fill up quickly during the summer. Do you offer trips during the week, or only on weekends? We offer trips on Saturdays and Sundays. 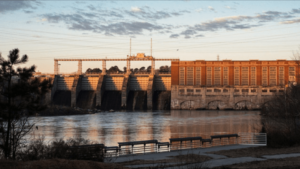 Duke Power releases recreational water flow to the river from Friday through Sunday from 10:00 AM to 3:00 PM. Our trips coincide with their release schedule. What happens if there is inclement weather, or a large change in water flow schedule? If there is lightning in the area, launch time will be delayed until the storm passes. If a heavy, persistent rain occurs, the trip will be cancelled, and refunds or vouchers will be issued for those customers. A large change in water flow schedule due to unforeseen circumstances may cause a trip to be delayed or cancelled. Customers will receive refunds or vouchers that will be issued in these instances. I called the number listed on the website, and nobody picked up- what is the easiest way to contact Rockin' River Adventures with additional questions or for bookings? The easiest/fastest way to contact us is through email:Email: rockinriveradventures@gmail.com You will normally receive a response within 12-24 hours. We will try to get back with you as quickly as possible if you call the number listed on the website, but can’t always guarantee that this will happen. We are husbands and fathers with day jobs. Where do I go to start the trip and how long does each trip last? You will meet our staff in the parking lot at the BMX Track. Click here for directions. Look for the Rockin’ River Adventures Trailer (you can’t miss it, trust me) and the signs saying Catawba River Outfitters. 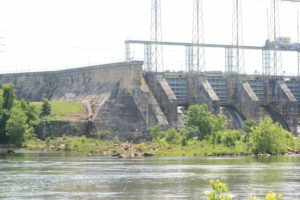 From there, our driver will shuttle you up to the launch point below the Lake Wylie Dam Guided River Trail. 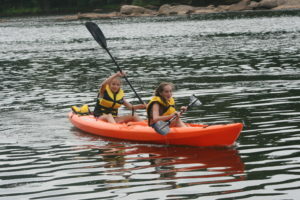 Once you are at the launch point, we will give you a brief crash-course in kayak usage. Below are a couple of helpful videos to get you started. 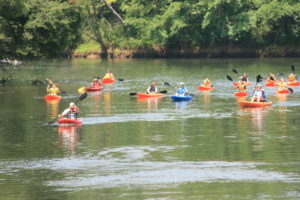 After launching, you are free to explore the river at your leisure; the distance between the launch point and the landing at Riverwalk is approximately 3 miles. This will take the average paddler about 2.5 hours. What should I wear on the trip? Should I bring anything extra? Plan on wearing articles of clothing that you don’t mind getting wet or dirty; bathing suits and old t-shirts are probably your best bet. Remember that you will be walking over some rocks in the lanuch area and at Riverwalk, so water shoes or sneakers are a good choice. We strongly advise against flip-flops since they don’t offer much foot/ankle support, they slip off your feet in the water, and don’t provide your feet much protection from rocks. Also bring a plastic bag to leave in your car for you can put your wet shoes in when you get out; they can make a bit of a mess. A small cooler with bottled water or soft drinks (NO ALCOHOL , PLEASE) is a good idea. Please remember not to litter. Plan on bringing out everything that you brought in. A wide-brimmed hat or baseball cap and bug spray (Cutter or OFF! are suggested choices) are also items you will definitely need. Water is a really strong reflector of sunlight and tends to magnify sun exposure exponentially, especially in the middle of the day. In English, please don’t forget sunscreen or you might regret it later. Bring a towel and leave it in your car to prevent getting water on your seats. Time tends to slip away from you when you are having fun on the river, so having a watch is a good idea also. How do I know where I need to take my kayak out of the water? Towards the end of the trip, you will cross under the I-77 and US-21 bridges. Riverwalk is less than 100 yards past the US-21 bridge on the right. When you reach the landing, simply paddle up into shallow water, step out of the kayak, put the paddle, leash, whistle and PFD in the boat, and our courteous staff will take it from there.